I'm starting a new thread despite the facts that Daikaya's new Izakaya shares owners, a name and a building with the ramen shop downstairs. I do this because it's a wholly different concept in most every way and I'm guessing the discussions for both will remain active and very different from each other. Of course, if that's wrong (I know the Izakaya is referenced in Daikaya's ramen shop topic title), please just combine the two but thought it worthwhile to suggest the separation. I'm also going to violate my own self-imposed rule of not assessing a new place until it has had to time to work out kinks and/or I've been able to visit a few times. Doing that because I'm not a food critic (or anything close to one), this new open is as anticipated as any in the city in the past year and already has lines waiting for tables, and, most of all, this may be helpful to some (always the goal). A very funky, cool take on the traditional Izakaya with a big focus on spirits, sake, beer and wine and pleasing food. Likely to do very well as a meetup spot and bar but probably less likely to win "best izakaya" in town honors even with time. Lots of good and interesting dishes, impressive beverage program and very good value across the board. After yesterday's NCAA "Elite 8" game at Verizon, we thought we'd try the newly opened Izakaya if there wasn't a very long wait. A good half hour after the arena emptied out into Chinatown and 45 minutes after the restaurant opened, it wasn't a problem at all. We got seats straightaway without any trouble though, by the time we left at maybe around 8:30pm, it was very busy with people waiting and the central bar area pretty full. I won't write a lot about the specific decor as I don't have much knowledge about Japanese art and design so wouldn't do it justice given all the thought and significance of many features. Both the Post and City Paper have already published excellent overviews of the design philosophy and specifics here and here in their pieces done pre-open. To us, the space is cool, edgy, and interesting in a modern and pop-culturish sort of way. They say the seating capacity is around 90 which includes nicely sized booths toward the back and a gaggle of comfortable two tops with 2 or 3 larger community tables toward the front facing out onto 6th St. The large bar dominates the middle of the space just as you reach the top of the stairs from street level. Entry is a separate door to the left of the ramen shop below, conveniently labeled "Izakaya." Someone was playing around with the lights last night enough for us and adjacent tables to notice and comment as they became darker, brighter and finally darker. Not a big deal but, on average, it's lit a bit darkly. Noise level wasn't bad for us when full but I'm guessing TS will report a noisier, higher number on the Sietsema-Noise-Meter. There is a fine line here between creativity and cutesy with the latter getting in the way of a more practically functional experience to a limited degree. One small example is the menu distribution 'policy' and menu design itself. The small plate, sharing philosophy behind the food is fun and worthwhile, however cliched. But, extending that sharing philosophy to menu distribution is silly. We went back up to the hostess stand to ask for a second menu for our table (we'd only been given one) and, after the hostess explained the intention was "that a table can share a menu," we were given another readily. Another group of six was also seated with only one menu. We found the menu itself cute but a bit annoying with colored paper pages pasted onto the first few pages of a heavy Japanese lifestyle magazine. Some of the pages had two sheets of colored paper pasted on top of each other, implying updated menus. We saw one table literally tearing out a page to see a page underneath it, thinking it an older menu (but it was only the 3rd night). Kind of interesting; a bit funny; more annoying. Suggest maybe considering a simpler, more functional menu or, at least, more than one per table. The bathrooms are cute, indeed reminiscent of shoebox-sized spots in Japan and a bit impractical with very narrow basins that make splatter and overflow more likely and the type of hand dryers that require one to insert hands into the device. - LIVE OYSTER GRILLED WITH SAKE & OYSTER SALT ($2.75/oyster): We ordered just a few of these to try them. Fine but nothing special. Maybe a tad under-sake'd and a bit overcooked. - SHISHITO PEPPER WITH GOUDA CHEESE ($3.25): 6 smaller-sized shishitos on two skewers, these were different from the more commonly found straight grilled Shishitos and very tasty. Our waiter told us about one in ten were especially hot and that was right. - MISO COD WITH CARROT PUREE AND PICKLED GINGER ($7.50): Not sure the carrot puree is the best accompaniment for this dish though the fish itself was fine. 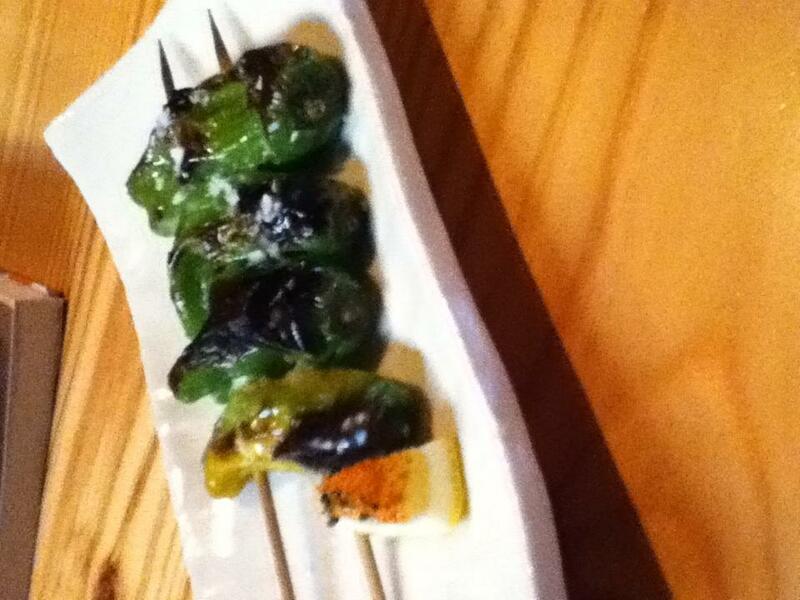 - GRILLED AVOCADO WITH PONZU AND FRESH WASABI ($6.25): This was an original and delicious preparation. One of our favorite dishes, it came served as a half unpeeled avocado grilled with pit removed and ponzu partly filling the pit cavity. Served with a spoon to scoop out and share. Wonderful combination of flavors. - CHAWANMUSHI WITH SHIITAKE AND PARMESAN ($7.75): Maybe a bit heavy on the parmesan but a very nice rendition of the egg custard dish with the finely julienned shitake almost mistakable for enoki. - FRIED MONKFISH (Comp'ed--See Service Notes): Also one the best dishes. Generous portion with light touch on the breading so plenty of nicely seasoned fish. The table next to us ordered two orders of this citing it as their favorite. - BRUSSEL SPROUTS AND PORK OKONOMIYAKI STYLE ($5.25): Its name notwithstanding (usually a pancake with cabbage and other ingredients? unless this refers just to the pork; maybe more likely? ), this was a very well executed version of the familiar 'grilled/broiled/baked brussel sprouts with savory pork' dish found in many restaurants of all types. Very nice char with ponzu or something sweet. A bit more pork belly, even if they had to raise the price a dollar or two, would improve it even more. - “RUIBE” TRADITIONAL HOKKAIDO FROZEN SALMON SASHIMI WITH FRESH WASABI, GRATED GINGER, AND SEKIGAHARA TAMARI (Didn't order): We didn't get this but I wanted to include it here because it was one of the more unusual dishes on the menu. We would have ordered it but were steered away from it by some advisors. Evidently, it arrives frozen, sliced very thin and melts in your mouth quite literally. - HOUSE FERMENTED JAPANESE VEGETABLES; HOME‐MADE NUKAZUKE, NAPA CABBAGE, TAKUAN ($5): As with most of the menu, good value for the price. Pickles a bit ordinary for Japanese restaurants. - STUFFED CABBAGE BRAISED IN DASHI ($8.50): Think this may have been the most expensive dish but still very good value. Generous portion of a mixed pork/beef filling in cabbage gently braised. One of the people at table next to us was from eastern Europe and commented the dish was similar to ones she knew from home. A gently seasoned and satisfying dish. - ANKIMO WITH MISO ESCALIVADA (see service notes): This was from the "unique dishes" section of the menu and unique it is, combining a great Japanese dish of monkfish liver with a Catalan veggie preparation. We were excited to try it. Unfortunately, it tasted of vinegar (not usually part of either dish from what I've experienced) and that flavor was a bit overwhelming. That said, they couldn't have handled this more nicely and graciously than they did (see below). - WASABI OCTOPUS WITH WASABI SPROUTS, GREEN APPLE AND ARBEQUINA OLIVE OIL ($5.50): A delightful, fusion-ish interpretation of the Tako Wasabe I had recently at Seki. Adding the apple and olive oil made this very good. I preferred it to the straight version at Seki and other places. We were there on what was only the third night for the Izakaya. And, as we enjoyed dinner, the place slowly filled to capacity. On top of all that, they're using a proprietary order-taking and transmission system that has some complexity and, for whatever reason, some of the servers were helping out from downstairs at the ramen shop. All said, and though of course there are kinks to work out, they performed wonderfully in many respects. Usually a mistake is an opportunity to delight--rather than disappoint--a customer if seen that way by a seller of anything including restaurant operators. Daikaya exudes this ethic whether upstairs or down. We noticed a couple of tables around us waiting a long time for drinks though food seemed to come out of the kitchen quickly. A manager comp'ed drinks. We had an issue with the Ankimo being too vinegary as described above. After a short and entirely constructive conversation with the manager, he took it back, didn't charge us for it and also comp'ed the fried monkfish. That was an above-and-beyond response we really appreciated. No point in detailing other minor service kinks they'll surely be smoothing out in the weeks to come. The hospitality of the staff is a solid foundation upon which to build. We didn't partake of anything but, by the looks of it, they have a very nice bar and beverage program with many interesting beer, sake and cocktail options. Will defer to others to report on that but suspect the program will earn strong praise. For a 3rd day, this was impressive and, overall, we enjoyed the experience. Most of the dishes were good or very good with a couple standouts. The place is very hip and no doubt will be very popular. Value is very good. I agree that the Izakaya merits a separate thread from the ramen restaurant. It has a separate entrance, menu, and space. I had some of the same dishes. The fried monkfish was one of my favorites. The breading was light, crispy and not greasy. I also liked the dipping sauce that came with it. The shishito peppers with gouda were cooked well (not a whole lot of gouda stuffed in the pepper). Shishito peppers aren't my thing though. I've had them a couple of other times (Ippudo in NY and Boqueria in DC), and I don't get the appeal. My skewer came with 4 as opposed to your 6, and none were spicy. I also had the pork belly and brussel sprouts skewers. They were good, though I was also expecting something a little different from the reference to being okonomiyaki style. It was pieces of pork belly and brussel sprouts on skewers. The reference to Okonomiyaki style must have just been for the generous sprinkling of bonito flakes and squiggles of mayo on top. I also had the abura miso onigiri (rice ball shaped as a triangle with pork inside and a sheet of nori on the outside). The pork was savory, and the rice ball was one of my favorites. I had a cocktail (don't remember the name but it had rye whiskey and star anise), which I enjoyed. Cheeze--maybe you were in the back section? We were in the front closer to 6th St. Interesting on the shishito variance, if there was one. We got two skewers with our order. I thought each had three peppers but might have been four each for 8 total. Did you only get four total? Agree there wasn't a lot of gouda inside but then again the peppers themselves were on the smaller side. I have a picture of my peppers. It was two skewers but both skewers were threaded through each pepper. A very funky, cool take on the traditional Izakaya with a big focus on spirits, sake, beer and wine and pleasing food. The small plate, sharing philosophy behind the food is fun and worthwhile, however cliched. Sounds like a traditional izakaya to me. Izakaya literally means "drinking place," so the drinks should be the focus. Because the emphasis is on drinking, the small plates are also usual -- not cliched at all. It draws from but clearly isn't "traditional" from the nature and number of fusion dishes on menu to the aesthetics of the place. Nothing wrong with that of course. My reference of small plates as cliched wasn't so much relative to the classic izakaya concept but, rather, relative to the ubiquity of small plates in restaurants across all categories. Last night was Daikaya's first "official" night of being open, and after a long walk across town, I got there at 4:30, only to discover the Izakaya opened at 5 (the ramen house is open all afternoon). I walked next door to Graffiato, and nursed a beer while watching baseball, then got into an empty, but eager, Daikaya right around 5, and took a seat at the bar. It's a good thing my hip bone isn't any wider - the seats that have backs are pretty narrow, but I've always had a birthing pelvis. The Dyson Airblade has competition in the hand-drying niche: Daikaya uses the Mitsubishi Electric Jet Towel which enables the diner, apparently, to request the check from the restroom - it has three buttons with lights: Power, Heater, and Check. The Rickey-San ($12) is a wonderful way to start Spring, it's a wonderful way to start dinner, and it's a wonderful drink, period, actually I guess this is a comma, that could pretty much take you through your entire meal. It's made with Hendricks gin, Matcha green tea soda, yuzu, and lime, and is bitingly acidic and only mildly sweet. I could drink this all night, and pretty much did. Jessica Sidman of Washington City Paper describes my Combination Pickle Plate ($5 for three) perfectly, and the one I got looked *exactly* like the photo in the City Paper article, "Fickle Pickles: Only One Man Can Touch Daikaya's Fermented Vegetables." You'll want to get these early in the meal, as if they were Korean banchan, and nurse them throughout. I loved all three (nukazuke, Napa cabbage, and takuan), but was particularly enamored with the takuan which, according to the article, is the only of the three that's not house-made, being imported from Japan. Ankimo ($8.50) with miso escalivada (a classic Catalan dish similar in spirit, if not in execution, to ratatouille) hints at the pan-everything lexicon that Katsuya draws upon in modifying Japanese classics. The escalivada was by no means an afterthought, and it was wonderfully made, albeit just a few precious bites. If you think about it, it's an odd combination, but it works perfectly well. My bartender warned me, correctly, that the Onigiri Rice Balls ($2.75) were ample, and I probably ordered them too early in the meal (but nibbled them throughout). This is one dish - which, incidentally, I haven't ever seen in the DC area - that I know extremely well, Matt's (my son's) nana being from Okinawa, and this being her home-run specialty dish. Hers are to kill for, and yes, taken as a whole they're even better than these, but both the kombu and abura-miso at Daikaya were good enough to make me crave them a day later. Interestingly, you have to wrap your own seaweed around the ball of rice (Shhhhh! Don't tell Matt's nana, but the rice itself was better), and I prefer mine pre-wrapped so the seaweed gets moist and loses its crackle - a minor nitpick that only a Rice-Ball Snob would even mention. Save these for late in the meal - they'll make sure you don't go away hungry, and won't break the bank in doing so. Either I'm just not remembering, or I've never before had, seen, or heard of, frozen sashimi, until last night, when I ordered the Ruibe ($6.50) - a traditional Hokkaido presentation of frozen (yes, still frozen) salmon sashimi with a dot of fresh wasabi, grated ginger, Sekigahara tamari, and some unannounced strips of white onion which, dipped in the tamari, were just wonderful. I'm not the biggest raw onion fan, but try dipping this by itself in the tamari and you'll see - this wonderful flavor would never be created with regular soy sauce. As for the salmon itself, I certainly found it interesting, but also feel that some of the flavor is lost because it's frozen - I'm going to research this dish a bit more to educate myself about it, and I look forward to trying it again after I do. Late in the meal, I switched to beer and ordered a bottle of Coedo Shikkoku Schwarzbier ($12), a fine black lager, dark in color, low in viscosity, and mild in flavor. If you drank this with your eyes closed, you wouldn't know it was this darkly colored. This lager would be a good transitional beer to introduce people to the world of darker-styled ales. I once claimed I didn't love Rappahanock oysters, but boy I sure loved Daikaya's Grilled Live Oysters ($2 each) which I assume were alive earlier in the day. Grilled in-shell with sake and oyster salt, the grilling and the sauce really made this *the* perfect oyster for the dish. In today's world, $2 per oyster at non-happy hour prices is almost cheap, and if you take into account the preparation involved, these are a fine value for the money. Pretty well stuffed at this point, I finished the meal with the interesting Stuffed Cabbage ($8.50) which I grew up with as my mom's extra-special dish, so this is my Ground Zero for comfort food. And Daikaya's version did not disappoint at all, the cabbage stuffed with ground Wagyu, ground pork, a bit of onion, and rice, braised in the striking combination of dashi and butter which took traditional Japanese, modified it to traditional Eastern European, and modified that to something else still. Dunk the inner meat liberally in the sauce surrounding the cabbage. My first visit to Daikaya was a success, with not a single bad dish in the entire meal. I didn't get a chance to request my check in the restroom, but I was highly amused, baffled, and befuddled by the menu which is inserted, page by page, into a magazine. I don't get it, but I'm not complaining either. You're off to a good start, my friends. You're right about the narrow basins. They should extend 2-3 inches further out from the wall; either that, or the faucets shouldn't jut out so close to the edge of the basin. This was my very first thought upon turning on the water (and yes, I did wash my hands before using the bathroom), and they're going to regret this, as the person washing his hands must be *very* careful not to get water on the floor. There may have been space issues, but there are going to be a lot of wet floors in here. This problem should be addressed now to avoid many headaches down the road - clean bathrooms (and, more precisely, dirty bathrooms) have an enormous impact on consumer psyche, and when people see a wet men's bathroom floor, they don't automatically assume the water came from the sink. One quick and easy way to fix this may be to turn the faucet counter-clockwise at a 45-degree angle, and retighten it so it juts out towards the front-right corner, although I don't know if this is possible based on the location of the knobs. If I remember, the sinks are rectangular, so this could provide plenty of extra buffer. We tried the Daikaya Izakaya and really enjoyed it. The short version is that this is very modern/fusion-ey izakaya food. Much of it had dominant flavors from outside of Japan (Contrast to Izakaya Seki). Our dishes were mixed, but now that we know what to steer towards or away from on the menu, it'd make a great meal. The ankimono (monkfish liver) was solid; very fresh, but served medierean style with eggplant, cipolini, roasted peppers, and tyme -- I didn't love the combination, though a tablemate did. Shishito peppers stuffed with gouda wasn't bad. It's not the light bowl of shishitos you're used to, but a tasty snack. Crab croquettes with old bay were good, though tasted nothing like Japanese food. Spicey cod roe spaghetti tasted a lot like fettucine alfredo, with a tiny bit of roe and/or seaweed flavor. The assortment of vegetables was fine but small and a bit plain -- not nearly as great as what Izakaya Seki does with veg. The frozen salmon dish which has gotten some discussion here was a subject of slight confusion. It's pieces of frozen salmon served with onions, wasabi, ginger, and a sauce. It tasted fine, but we thought the frozen aspect detracted from the dish. Basically you hold it in your mouth until it defrosts. One minor nit: The host stand is still learning to manage seating. About 10 minutes past our reservation time, we'd had no contact from the host stand. Finally they noted that our table was still drinking and offered our group of four a row of four seats on a two-sided communal table. A row of seats, of course, is not great for a group larger than two or three because it's hard to talk from one end to the other. We noticed that the only folks seated there were a group of three also sitting in a row. We suggested that perhaps they'd like to sit two and one across, so that the four of us could sit two and two across and not be having a conversation directly in their faces. The hostess wasn't sure if she could ask whether the three would prefer that and then disappeared for a good while without letting us know what was going on. We were eventually seated (about 20-25 minutes after our reservation time) at anothther table. No big deal, but they may need to work on managing reservations, managing the communal table, and offering drinks as reservation times come and go. We were there early on Friday evening - not quite early bird but still during happy hour - and were surprised by the speedy pace at which the food were pressed upon us. We started with 4 items and a bottle of sake. The first four were grilled oysters with salt/sake (2 each), fried monkfish, a special of braised baby squid, and grilled avocado, listed in the order of my personal preference. All were fantastic dishes but I loved the grilled oysters the most because the light grilling really emphasized the flavor of these local oysters. Don't order them unless you like to chew and taste your oysters before they go down the hatch. The fried monkfish breading is incredibly light and the fish itself is incredibly tender, and the whole thing well seasoned. These are amazing because Captain Joe Schmoe can't help but overcook every piece of fried fish on your captain's platter. The braised baby squid had a mushy texture, but they sure did absorb the soy based braising liquid and are essentially flavor bombs in your mouth (do I sound like Guy Fieri?). The avocado tasted wonderful after being grilled - but it's still just avocado, served with an aioli and some salt. The next 4 were Ruibe, Ankimo, one of each rice balls, and crab croquettes. The defrosted salmon was flavorless. I made the mistake of eating the monkfish liver with the escalivada in one bite - could taste how wonderful the veggies were but couldn't taste the monkfish liver. Not a fan of the rice balls and wouldn't waste any stomach estate on them in the future. As for the crab croquettes, great filling inside but I couldn't detect any crab flavor. We finished with 3 more dishes, a special of raw baby squid, grilled oysters with teriyaki sauce and parmesan (2 each), and miso braised saba. The raw baby squid had the same mushy texture, which reminded me that the baby squid that we had recently at Sushi Taro was also mushy. So they're simply mushy, but cooked or raw, they're great at soaking up flavor. I was not as much of a fan of oysters with cheese. These oysters were smaller and while the taste of cheese is great, overpowered any flavor the oysters had. The miso marin braised saba is a winner - tender sweet fish with just a hint of mackerel fishiness. At this point we had dropped about $80 on food and $80 on drinks and we hadn't had enough so we went downstairs and I had a bowl of shio ramen. I really liked the light stock, could probably live with less stir-fried bean sprout. The kitchen is efficient but where is the love? Went for first time on Saturday night with my wife. It had some highs and lows. I liked the space, very fun and funky bar with japanese decor - very reminiscent of what I experienced in Japan a few years ago. Service was very good - explained the unusual menu and daily specials fully but without a ten minute BS speech on the restaurant/chef's "concept", food and drinks brought promptly and servers were generally available for an extra spoon and to ge the check when needed. I also liked the cool handheld order taking devices the servers have so your order is sent immediately to the kitchen - very nifty and appropriate for this type of small plate dining. We had two cocktails to start - the Bruce-Lee-Chee which was on the sweeter side but not too sweet. I thought it was ok, but wife loved it. The Solstice? sparkling watermelon cocktail was a failure though - the menu warned it had pickled watermelon rind in it among other ingredients - but it was way to pickly/sour for our taste - great watermelon scent though. The burrata salad with tomatos and dashi gelee was a good concept. I liked the dashi flavor melting into the otherwise high quality ingredient but standard cheese/lettuce/tomato salad - but it was hard to eat right even with a spoon (vs. chopsticks). The dashi gelee just ends up falling to the bottom and coating the plate in what looks like gray slime - not really the most appealing and then you end up with bites without the dashi and just dashi bites. I think the chef has a good idea, but the execution needs to be tweaked. The fried garlic is awesome. Frying it makes the cloves come out creamy and mild but still garlickly and the pairing with the chili-miso sauce for a spicy kick is great. The assorted pickles were really good. I've had a lot of japanese pickles and they aren't usually my thing, but based on the reviews I tried them and really liked these ones. Especially the milder yellow one (sorry don't recall the name). The edammame was a large/regular size portion (I always find I get too much at restaurants of this side dish) that were cooked very well - but when they say chili is an ingredient they should emphasize it. The pods and oil underneath are coated in chili pepper making this a rather spicy dish. Unfortunately that ruined it for my wife who can handle some but not alot of spice. Beef tenderloin skewer was very good and straightforward - one skewer of very nicely charred steak. Based on my review of reviews before I went, I'm surprised no one has much mentioned the more traditional robatayaki skewers (vs. shisito pepper with cheese) - this is likely some very good eats that are more traditional izakaya fare. Lastly, the japanese eggplant with lamb and yogurt sauce was ok. The eggplant was oddly very sweet which wasn't the best contrast for the tangy yogurt sauce and ground lamb. I'd probably skip this dish next time. So I would go again but only with adventuresome eater and probably only for drinks with a few plates to share. I don't think this is my kind of full dinner destination. After the above, we were still hungry so we headed to Central. The tuna poke was weirdly mushy and a tiny portion for $10. Most of the dishes we got were on the small side for the price, and none of them were standouts (in addition to the poke, we got the assorted pickles, chicken liver skewer, beef tongue skewer, shishito pepper, and chawanmushi). We also ordered the wasabi grilled octopus, but the server forgot to put our order in. Still hungry after the $50 tab, I think I'll be sticking with Seki for my izakaya jones. We both opted for Yuzu Lemonade. The first dishes came, the Steamed Chicken and the Octopus. Other than being slightly less than completely cooked (steamed? ), the chicken was one of the better dishes of the night. The Sesame/Tofu sauce had a nice touch of Wasabi and was probably the hight point. At the same time as the chicken, the Octopus was delivered. I think it was the octopus because some of the 1/4" cubes were chewy and some were crispy(ish). There were also small round things in a rather viscous liquid. The menu said it was olive oil, I'm going with Mobil 1 5W-30. Next up was the Chawanmushi. Between the version served at Korean restaurants in Annandale and the version here...sorry, I'm sticking with Annandale. What should have had a hint of egg flavor, had zero. For some reason, I had a problem connecting this version with what we had eaten in Tokyo. It was soupy and had a tendency to slide off the spoon. Grover told me that the brownish things resting on top of this interesting dish were mushrooms but, as far as I could tell, they may have been minute slices of pork from downstairs. Next, the Crab Croquettes. Four small deep fried balls of....something. I managed to spot one (extremely) small piece of crab but I think it may have been a mistake because none of the other three showed evidence of containing crab meat at all. They did have a rather unusual creamy liquid inhabiting their interior (not filling, just hanging out casually). These were promptly declared "interesting" but without much enthusiasm. We looked in vain for the tonkatsu sauce and hints of Old Bay and found neither. Eminently forgettable, and at $2 each...well, the less said about that, the better. The "fish special" was okay, sort of the thing you'd find at a good buffet. It held it's own, but, considering the competition, that's not really saying much. At this point, we stopped sharing dishes (why add to the disappointment?). The highlight of Grover's dinner was the Cod Roe Spaghetti. Grover swore she could taste roe but I didn't see evidence of any in the dish. That may have just been me, she said of all the dishes she'd had, that was the best so far. And for a final dish, the Rice "Balls" which I asked for with salted plum. I don't know if you've ever had this dish, but it's generally a salted plum (with seed still intact) wrapped in sushi vinegared (sometimes) rice and then wrapped in Nori (or seaweed if you prefer). This version was a triangle of steamed rice (no sushi vinegar) on a very large sheet of nori with a sparse reddish brown filling that represented salted plum. If I had been from the Salted Plum Association, I'd have been insulted. A four inch pyramid of rice, an interesting "reddish brown" center and a sheet of seaweed. The ultimate in fix it yourself food. The menu says Onigri rice balls and so do I. I'm trying to figure out how one pile of rice equals "balls". Oh, about that yuzu lemondade? An 8 ounce glass with 2 ounces of ice and a slice of what appeared to be pink grapefruit rind. When we had emptied the contents, the glasses were unceremoniously whisked away without even a polite inquiry as to whether we'd like another. Interesting concept in not being bothered while you dine. Some semblance of lemon flavor (Yuzu? Maybe. It was somewhat hard to tell. Not particularly tart and if you've ever sampled yuzu, you know the definition of tart). For this rather not very soul satisfying venture on Metro and into and out of Gallery Place, the tab was $76 before tax and tip or not quite $9 a dish. PS: On the way home, we stopped in Del Ray and had dessert. That order was promptly taken, promptly delivered and service was excellent. The wine didn't hurt either and both the sorbet and the frozen souffle were outstanding. This is quite a distressing report. Hard to believe there are so many misses in a place that is so attentive to quality and consistency downstairs in the ramen joint. I haven't been yet; but in light of accounts such as this -- and the options of ramen here or remarkably consistent izakaya at Seki -- I'm somewhat reluctant to risk the $$. Has anyone had better luck? <Cliche ALERT!> It was the best of times, it was a dark and stormy night. Okay, so it wasn't dark and it wasn't stormy but it definitely was a Good, Bad and Ugly experience. I haven't been back since my own bad experience there, but I've heard similar things from friends. I would go out of my way at this point to warn people about it (uninspiring/mediocre food, high prices, small portions will do that). Too bad, too, because it's a neat space. Burma, on the other hand, has been putting out tasty and reasonably priced food across the street for 12+ years now. The ambience is nonexistent, but between ambience and taste/value, I'll choose the latter every time. In a somewhat weakish attempt at rationalization for the food here, I'd suggest this is Japanese food for people who have never eaten Japanese food (okay, maybe sushi) and want to try something different....but not TOO different. If the diners who were around me are any indication, I believe with the exception of Grover, one server and a nice lady three tables away, there was an astounding lack of Asians. Daikaya Izakaya is a Japanese izakaya viewed through a modern, American lens. It serves what are essentially bar snacks, meant to be consumed with drinks in an approximately 1:1 ratio. It's not really any more "serious" a restaurant than the ramen shop downstairs. If my one visit was any indication, it fulfills its basic mission fairly well. Daikaya shouldn't be compared with Izakaya Seki, which is a serious, but casual, Japanese restaurant. The two restaurants are apples and yuzu. The ramen shop downstairs, as well as Izakaya Seki, both serve food that tastes good and doesn't feel like a ripoff. That's where Daikaya Izakaya fails in its mission, in my opinion. Somebody should notify the people on Friday night who were sitting around us that it's not a serious restaurant. They were doing very little drinking. The only alcohol I saw being consumed on the side of the house we were on was one bottle of Sake. It's missing the salary-men and the late nights and the smell of cigarette smoke and booze. I agree it's not "really any more "serious" a restaurant". If it's not a serious restaurant, the pricing certainly is close to "serious restaurants" and viewed through only the lens of pricing, it promises much but delivers very little. When Katz was at Atlantico, the food was very good and (almost always) worth every penny. Here? Not so much. Have just been once shortly after opening (first report above) but largely agree. RW's "apples and yuzu" is definitely the right way to think about any comparison with Seki. Downstairs is where it's at for Daikaya--in the ramen shop. Different thread. Contrary to Escoffier's assessment, I know Japanese cuisine very well, and enjoy eating it...and I enjoyed our meal at Daikaya today. It was only brunch, and a short one at that, since the little dude decided to go into full toddler meltdown, but it was enough to convince me to come back. The 2 high points of the brunch (and now my 2 favorite brunch dishes in DC) were the chicken karaage with red bean-filled waffle, and the "everything" onigiri with smoked salmon, salmon sashimi, and ikura. Both were original, and more importantly, delicious. The miso bacon was also salty, salty goodness. The grilled eggplant (off the regular menu) wasn't much of anything. The mentaiko donburi was good, but could've used more mentaiko. Of course, unless something comes with 1/4 cup of mentaiko on top of it, I am of the opinion it needs more mentaiko. We'll be back sans toddler and with friends to sample more of the regular dinner menu, and get into some of the cocktails. I met my boyfriend here Wednesday night after a work event. Both of us really enjoy both the ramen shop and the upstairs restaurant and since Daikaya is in our neighborhood we end up going about once every 2-3 weeks. As we have explored most of the menu we ended up sticking to our favorites this visit. Our favorite dish here is the Wasabi Tako, raw octopus with wasabi sprouts, olive oil, and granny smith apple. We usually order two of these so we can each have our own but this time stuck with just one order. Another dish I really enjoyed was the burrata salad with arugula, tomatoes, dashi gelee, served with a ponzu vinaigrette. This is a great salad. My only complaint is that the dashi gelee is incredibly heard to eat with chopsticks and is such a key component in the dish that it is sad the much of it is left on the plate. Another great dish was the grilled enoki mushrooms. We also really enjoyed the tuna poke. We also ordered the grilled quail which was very solid (not overdone), but not great. Finally, we had three onigiri: one kombu (soy and seaweed) and three of the duck onigiri that was on special. I am not as big an onigiri fan as my boyfriend but enjoyed the duck onigiri very much, so much so that I asked for a second order. Service was fine, but a little rushed. Also, our server was very amped up and spoke in a raised tone for the whole night which was a little off putting. She also interrupted us to tell us we were eating the onigiri incorrectly (which we did on purpose), which resulted in a little side eye from me. We even felt a little bit rushed even though we were seated at 8:20pm, no where near the restaurant's closing time, and were out by 9:30pm. Overall, I really enjoy Daikaya and am really happy it is in my neighborhood. Continuing our "return to DC" adventure (I hope I am not boring you all with these posts) we made a reservation here last night and really enjoyed it. My sister lived in Japan for years and I visited and ate well there. I think Daikaya is a fun and contemporary rendition of an izakaya. We shared many things, and the only miss for me was the grilled oyster, which was dry. The pee wee potatoes were awesome, all of the meat skewers were tender and juicy, the grilled avocado was nice (I am so going to do that at home), the zucchini was great and we liked the eggplant with pork. I like a meal that affords many different kinds of flavors and textures and so this experience was fun for me. You have to pace the meal, which we learned after the first round came very quickly and was consumed quickly...we had most of our wine still and had to slow down our ordering to make the pace more relaxed. It was no problem to order two or three dishes at a time when we were ready. The server seemed to catch on that we were not in a hurry. There were lots of people in Caps gear who may have been rushing to eat before the game, as tables were turning pretty quickly. If you go here, do note that the Izakaya has a completely separate entrance, just north of the ramen shop entrance. We got caught up in the insanity of the ramen crowds and it took a while to break through the people waiting to get to the host stand, only to be told there was a different entrance. Quite the opposite! I quite enjoyed your posts on your tour through Shaw on Friday. Keep posting! I haven't eaten at Daikaya, but I have been to the ramen shop below several times and immensely enjoyed it. That being said, I enjoyed the multi-faceted "review" of the restaurant in this weeks magazine for one reason. Philip Kennicott's review. Paragraph's 3-5 really spoke to me and I loved it. The "You're going to love this next piece because it's in B flat" line made me laugh out loud. We need more of that. Much more. Hey, as the father of a b-flat clarinetist, I can relate.